So let me answer this question for those who look at my seating collection and think this guy is mad! On the face of it, I fully understand why many people think that I'm pushing my luck and if I wasn't in the trade myself I may be inclined to agree. Many people would expect to see these stripped armchairs in skips rather than gracing fabulous homes. But you have to look past the visual aspect and focus more on the construction of the frame, what material has been used and the quality of the legs. This is where the value lies. The reason I sell my chairs stripped back to their original calico or hessian is to allow customers to take them as they are and have the chair covered in their own choice of material. Each chair has a character that only age and history can give it and once covered in a new fabric, would sit very nicely in any home. 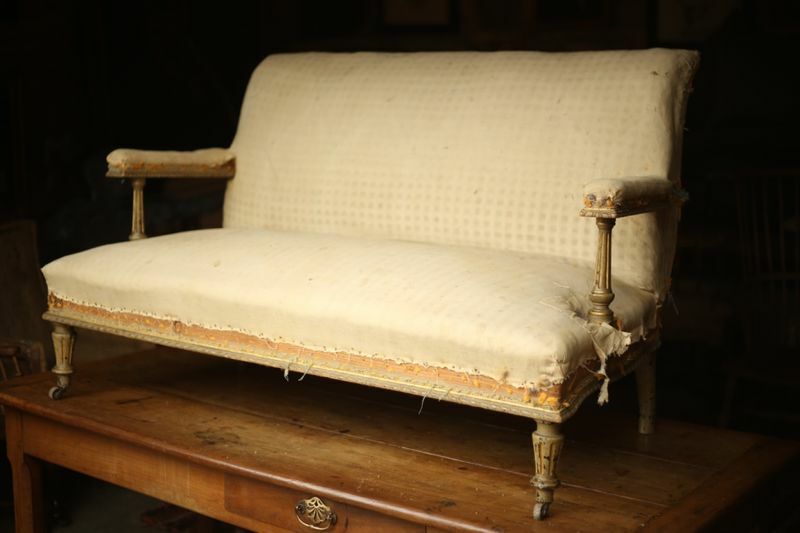 There are examples of new armchairs on various home stores websites that retail for £800 upwards but it’s more than likely that they will be made of low-grade materials to keep costs down, meaning the quality of these is well below that of an antique armchair crafted by one person out of high-grade material such as Mahogany, Walnut or Rosewood. New chairs would also lose most if not all their value in a few years time whereas quality antique chairs will hold it and potentially increase in value. This is something to consider as your tastes will change and wouldn't it be nice to sell the chairs you have fallen out of love with, rather than give to charity or sell on eBay for a fraction of the cost like most of us do with new furniture. As I say, antique armchairs were crafted by talented individuals in limited numbers, meaning they come in all shapes and sizes allowing you to add something totally unique to your room. This will only be enhanced by the addition of your choice of material. Thank you for reading. I hope in some way this has opened your eyes to the possibilities of using an antique armchair in your next home project. I work with a wonderful upholsterer so that I can offer you the full service. So please, if you see a chair frame you like but want it upholstering before it is delivered get in touch and I will provide you with a quotation. If you have your own material then I can arrange it to be upholstered in that or I am able to find you a choice of materials and we can go from there.